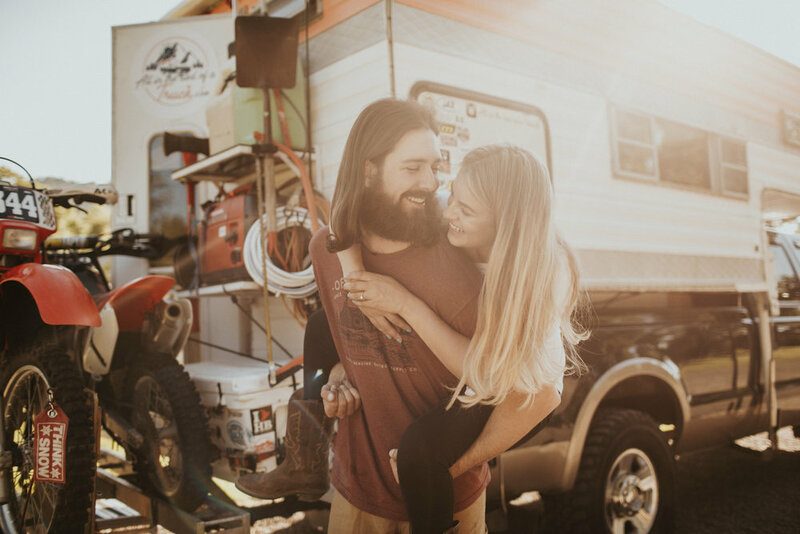 We are Jimmy and Hannah and we have been living on the road since March 2017 with our two mutts in a converted 1969 truck bed camper, which sits inside a 2017 Ram 3500 pick-up truck. We have a two dirt bike carrier hitch for our dirt bikes that we use for an alternative form of transportation and a canoe on the roof that we ended up purchasing in Whitehorse, Yukon. In these past six months while in North America we have traveled to CO, UT, AZ, CA, OR, WA, ID, MT, WY, Alberta, British Columbia, Yukon, and Alaska where we traveled to Prudhoe Bay the furthest North one can drive in North America. Since we have already hit the most northern and western roads one can travel in the U.S. we plan on visiting the most eastern and southern parts as well within the next three months. The idea of traveling and living life on the road began with Jimmy. 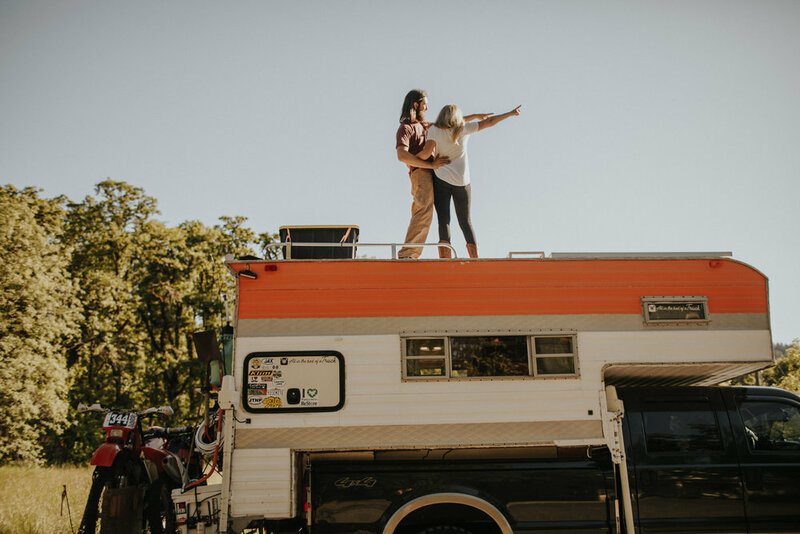 It had been a dream of his for several years and in 2014 when we first met on our third date he told me about his desire to buy a truck camper and travel to Alaska. I never imagined that three years later we would be engaged and traveling the world together one mile at a time. We were both over the daily commute and ultimately just living for our 48 hours of freedom every weekend. We wanted to take this journey while we were young and able while exploring to find a new home for our family. In Colorado Jimmy had been working as an engineer for six years and I had been working part time doing environmental science work and attending graduate school. In March of 2016 we ultimately found our new home on Craigslist and met the owner in an old storage lot in Arvada, Colorado. The camper had not been used in over 15 years and the jacks, which support the camper were submerged almost eight inches into the ground. We walked inside and the place had good bones no leaking, no mold, and some of the coolest original 1970s orange appliances. We were SOLD. We bought the camper for $1,200 and traveled in it as is for six months before we decided the best way to convert the camper for full-time use. Fall of 2016 we spent 3-4 months converting the camper to fit our little family for a year of travel on the road. We gutted almost the entire camper, converted it to solar energy, and worked to make the camper viable in -40 degree temps to 100 plus degrees. With every renovation we made the camper was beginning to feel more like home. The camper is complete with shower, toilet, oven/stove, fridge/freezer, furnace, 30-gallon water tank, and 2-235 watt solar panels. We repainted the exterior including the orange paint, which matches the original appliances inside. We took several weekend trips during the remodel to make sure everything operated correctly before we embarked on our adventure. In December I quit my job, graduated from my masters program and in February of 2017 Jimmy quit his job and we sold our home in Broomfield, Colorado. Selling our house and saving money over the years is what financially made this adventure possible. We hit the road in March and explored the southwest and northwest until we began having truck problems in Washington and ultimately had to buy a new truck, the real kicker was that we had to physically register it in Colorado. Typical of most road trips there are unexpected journeys and that led us back to Colorado for two weeks and then we headed north from there for Alaska. Traveling in such a confined space on the road for several months has posed immense challenges, but everything life on the road has thrown on us we have been able to tackle TOGETHER. It is not conventional and it's most definitely not always easy, but living this lifestyle together is the best marriage boot camp. We have to learn to work together, communicate better, and resolve disagreements fast to make this adventure work. We have learned how to literally not step on each other's toes everyday and how to help each other with basic tasks. We definitely do not have it all figured out but this trip has been the perfect opportunity to focus on us and what we want for our future! We talk frequently about our next steps and where the future is going to lead us. Most of the questions we receive surround our future. Where are we going to live? What are we going to do? How much longer are we going to live on the road? We don’t have all the answers yet, but we do know that we can make this lifestyle work and it has vastly improved both of our lives. Within the next three months we plan on making some adjustments we are converting our truck to a flatbed for more storage, we will be remodeling the interior of the camper including constructing a new kitchen and sleeping area. After living in the camper for an extended period of time we have now have an even better idea of how we can make more efficient use of our limited 70 square feet.